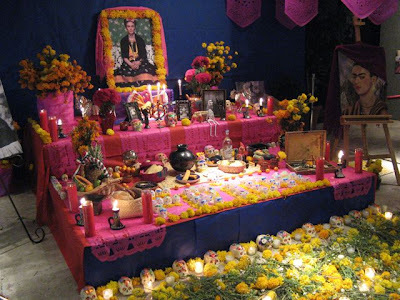 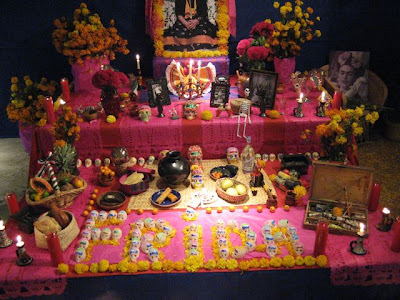 Ofrendas at Centro Mayapan. 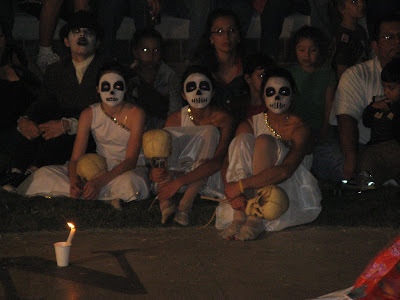 Photos taken at Festival Dia de los Muertos at Centro Mayapan, El Paso, Texas, November 3, 2007. 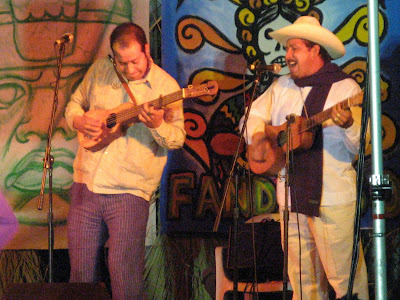 The wonderful Son Jarocho group from Veracruz — Son de Madera. 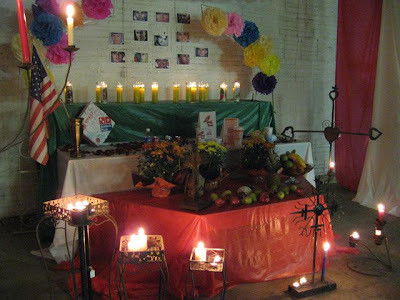 Photos taken at Festival Dia de los Muertos at Centro Mayapan, El Paso, Texas, November 3, 2007. 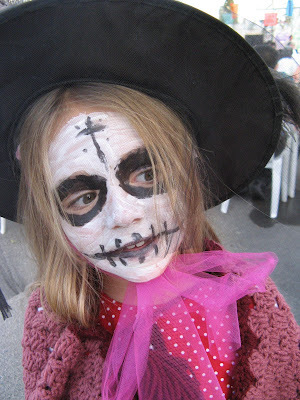 My daughter as a Catrina. 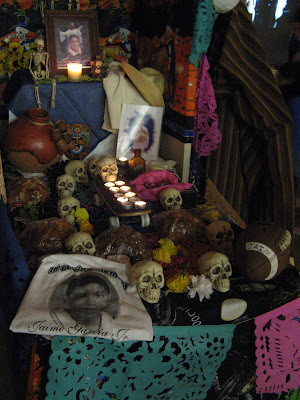 Photos taken at Festival Dia de los Muertos at Centro Mayapan, El Paso, Texas, November 3, 2007. 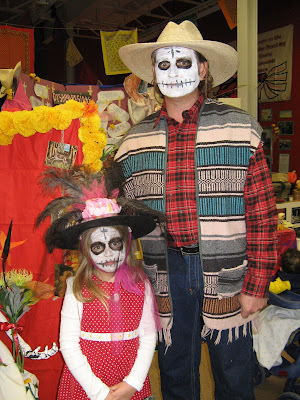 A very tired Catrina three hours later, and yours truly — Mondo Loco. 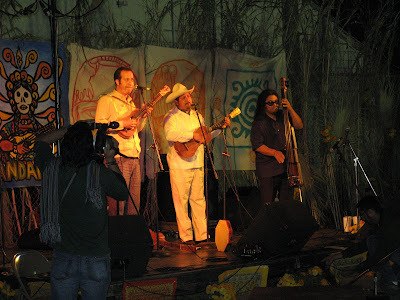 We were stopped several times for photos, including El Diario and What's Up. 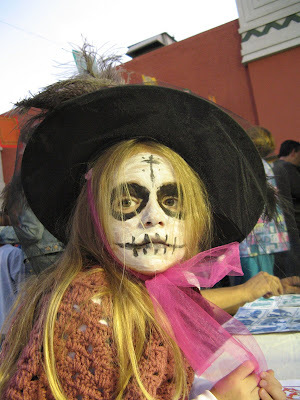 Photo taken at Festival Dia de los Muertos at Centro Mayapan, El Paso, Texas, November 3, 2007. 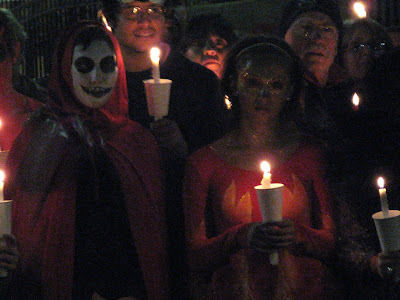 Processional through Union Plaza. 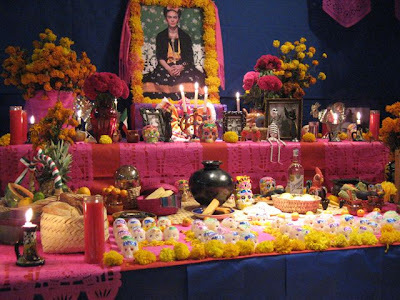 Photos taken at the Dia de los Muertos Celebration at Union Plaza, El Paso, Texas, November 2, 2007. 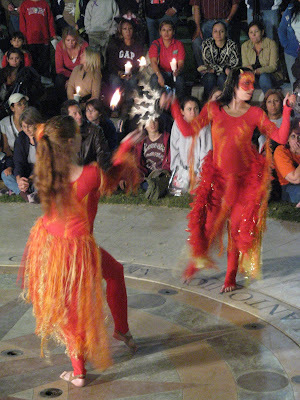 Dancers at Union Plaza. 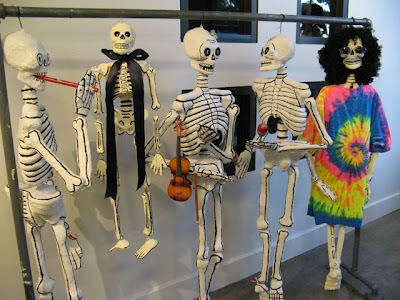 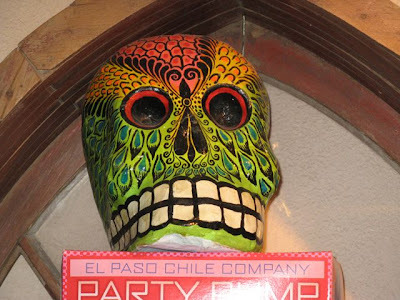 Photo taken at the Dia de los Muertos Celebration at Union Plaza, El Paso, Texas, November 2, 2007. 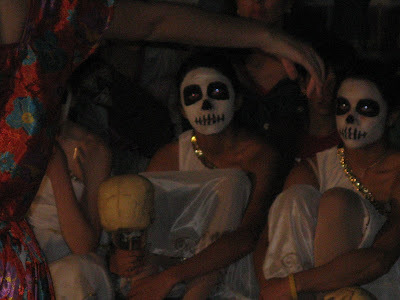 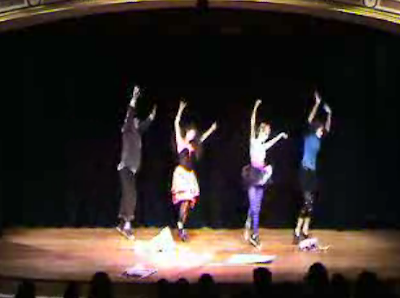 Dancers watch a fellow troupe. 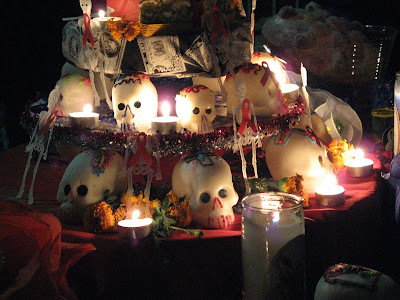 Photo taken at the Dia de los Muertos Celebration at Union Plaza, El Paso, Texas, November 2, 2007. 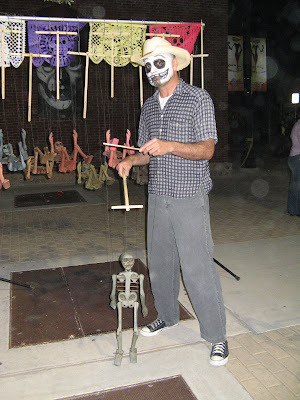 El Paso artist Cesar Ivan with one of his hand-made esqueleto marionettes. 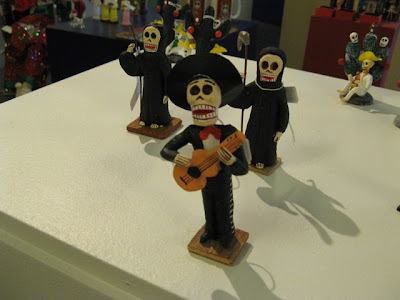 I'm glad to own one! 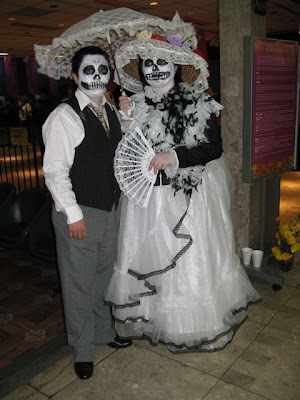 Photo taken at the Dia de los Muertos Celebration at Union Plaza, El Paso, Texas, November 2, 2007. 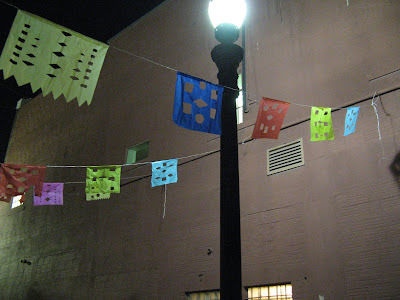 Papel picado streamers adorn Union Plaza. 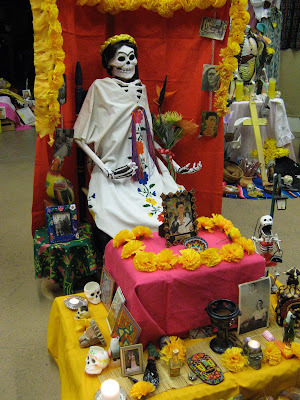 Photo taken at the Dia de los Muertos Celebration at Union Plaza, El Paso, Texas, November 2, 2007. 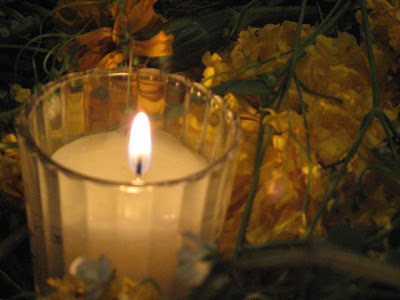 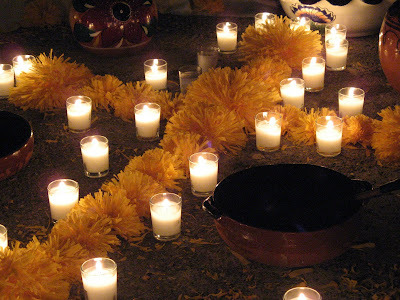 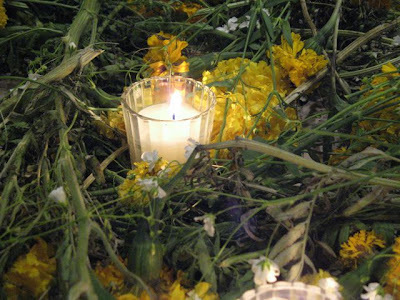 Candles, marigolds and water on an ofrenda. 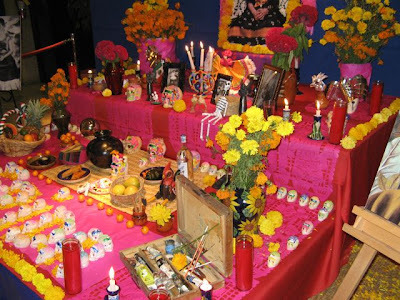 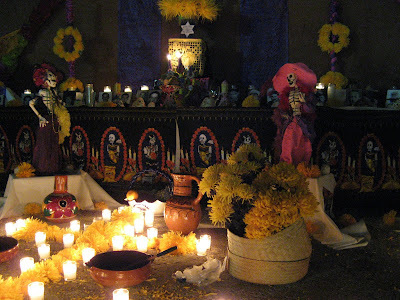 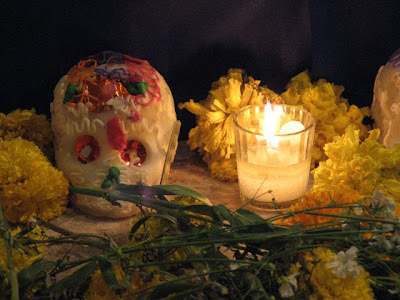 Water is a common offering during Dia de los Muertos. 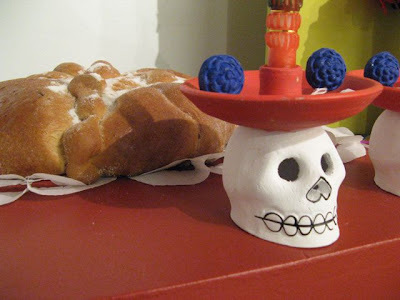 Others includes salt, pan de muertos and fruit. 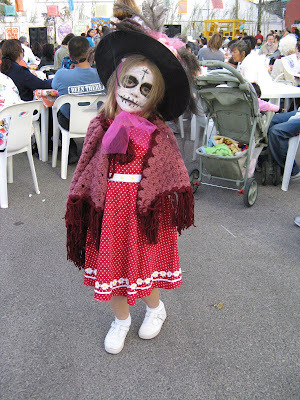 Photo taken at the Dia de los Muertos Celebration at Union Plaza, El Paso, Texas, November 2, 2007. 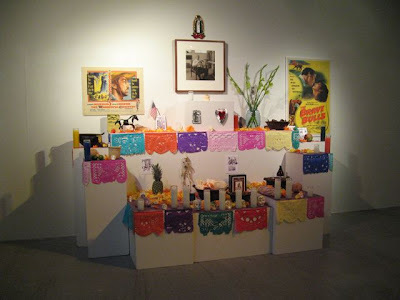 This ofrenda was in honor of El Paso's police and firefighters fallen in the line of duty. 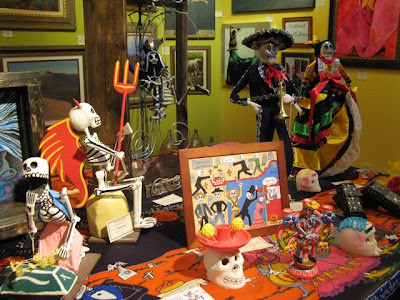 Photo taken at the Dia de los Muertos Celebration at Union Plaza, El Paso, Texas, November 2, 2007. 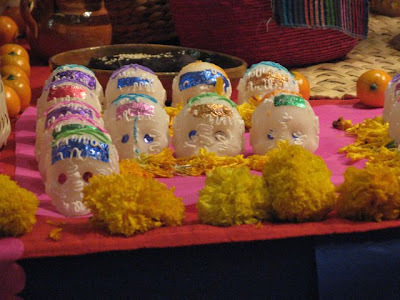 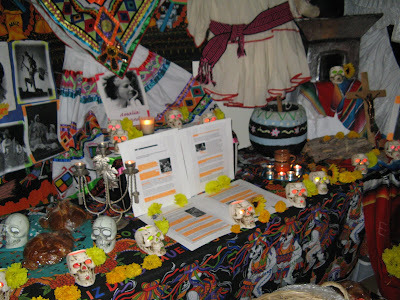 Sugar skulls adorn an ofrenda. 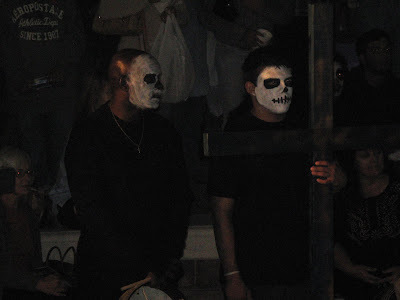 Photo taken at the Dia de los Muertos Celebration at Union Plaza, El Paso, Texas, November 2, 2007. 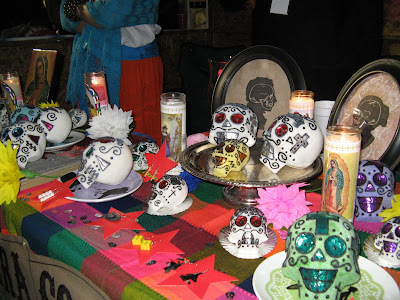 Sugar skulls being sold by El Paso Calavera Company. 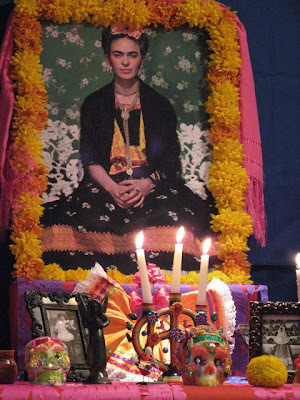 Photos taken at the Dia de los Muertos Celebration at Union Plaza, El Paso, Texas, November 2, 2007. 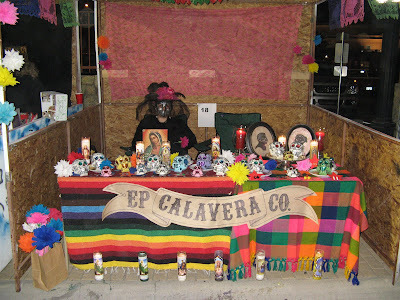 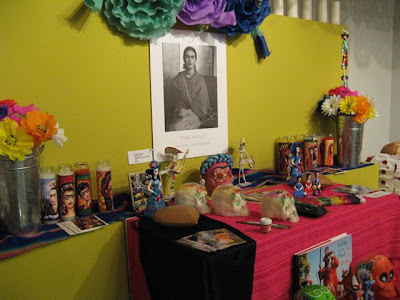 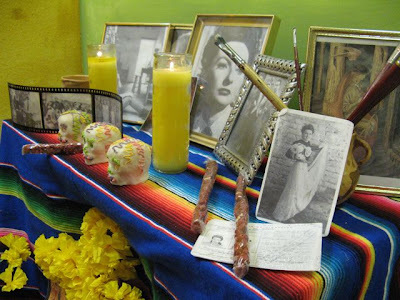 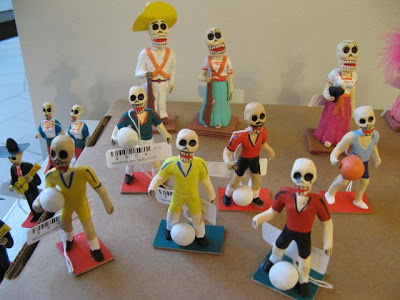 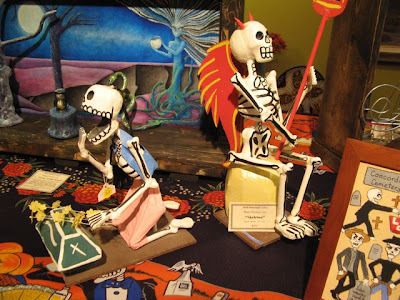 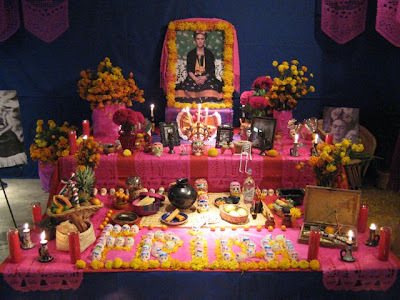 I purchased the figure in the left of this photo (female calavera kneeling in front of casket). 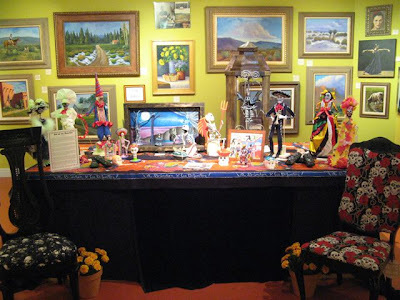 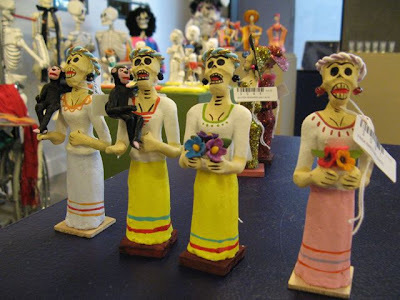 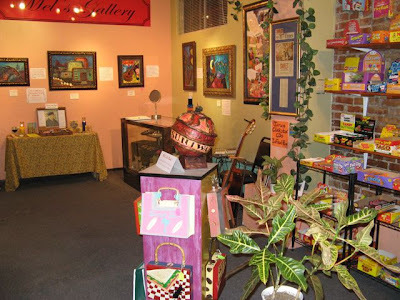 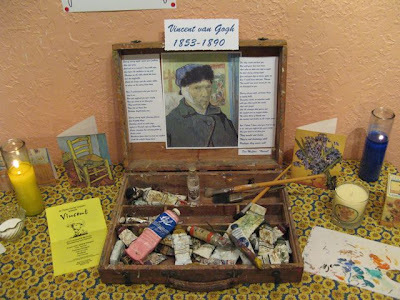 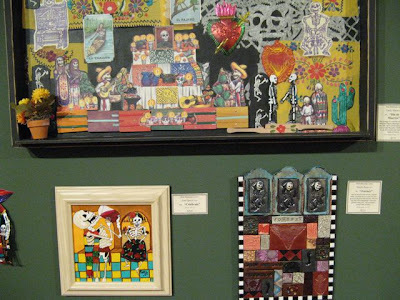 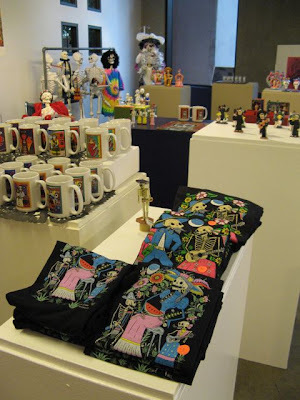 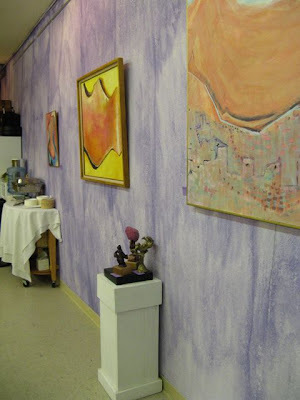 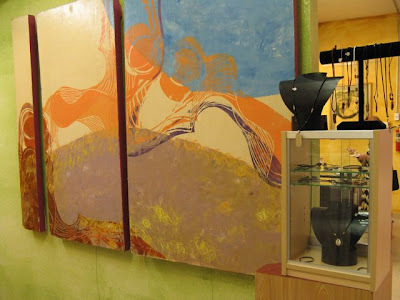 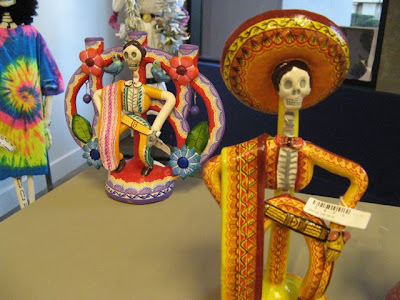 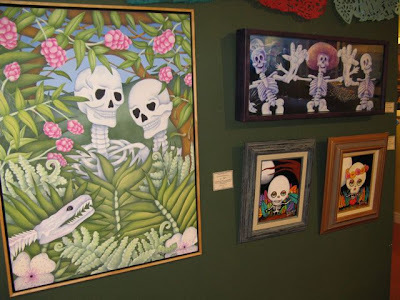 Original artwork, folk art pieces and large ofrenda at the Hal Marcus Gallery. 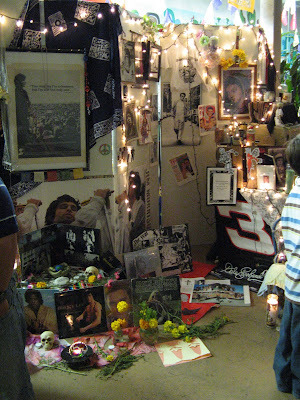 Part of the Culture Cruise to Die For, November 1, 2007.